When a chimney is said to "not meet code" it's important to note 2 things when referencing historic codes. First, the date a building code was written is years before it's adopted in individual localities. So just because a code written in a given year that doesn't mean your locality had adopted and begun enforcing it. Methods and materials specified 100 or more years ago have often been proven unsafe and therefore have been updated in years since. That said, here's the link to the 1911 BUILDING CODE. (Chimneys are referenced beginning on page 36). "Sec. 131: All chimneys shall be built of brick, stone, or other fireproof material. The exterior walls of chimneys shall be at least 4 inches thick and constructed with a suitable flue lining of terra cotta, or 8 inch walls without lining may be used." So a 4" (or 1 brick thick) chimney had to have a terra cotta liner but if the chimney was built 2 bricks thick then no liner was required. What they didn't anticipate at the time is that mortar can deteriorate considerably when exposed to soot, especially coal soot, and the other byproducts of combustion; a terra cotta liner (clay tile) effectively protects the mortar inside the chimney. The code writers built in a provision to amply cover their bureaucratic butts and assume ultimate authority in Sec. 134. All existing chimneys that the Department deems dangerous in any manner whatever, shall be repaired and made safe or taken down. This is interesting as it gives the building inspector the power to enforce codes retroactively; generally code requirements are not applied retroactively to existing structures. 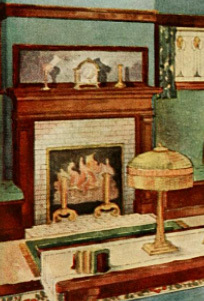 Other sections of the 1911 code have been proven unsafe, most especially the reference to allowing the venting of more than 1 appliance in a single chimney flue, a practice strictly prohibited today. Sec. 136. Note more than two stoves or two furnaces shall be connected with an 8-inch by 8-inch flue, nor more than four stoves or three furnaces with an 8-inch by 12-inch flue, and one flue only may serve more than one story if properly offset to prevent back-drafts. Venting more than one appliance into a single flue leads to excessive soot or creosote buildup and this problem is multiplied when more than one type of fuel is used in those stoves, for example, a coal stove and a wood stove. Additionally, the smoke and fumes from a downstairs stove can allow fumes to enter an upstairs room, most especially when the upstairs stove is not in use. In short, codes in effect at the time your house was built provide guidelines to reference the minimum requirements of the day, or a few years later when they were actually adopted. However, we know a lot more about all areas of home safety today and need to apply more recent standards of best practices. You would generally not be REQUIRED to line an unlined chimney flue today because the chimney was built to the standards required at time of construction. However, an unlined flue has been proven to be a considerable hazard and lining it is best advised. The most important thing to know about venting appliances into an existing chimney is the requirements of the appliance. If the appliance specifies a liner must be used then installation of a new appliance MUST include lining the chimney to meet the requirements of that product. A good example is a gas insert; the appliance will generally require dual 3" chimney liners and an inexpensive aluminum liner meets this requirement.